Short for auxiliary, aux cables can be used to connect audio devices (MP3 players, smartphones, etc.) 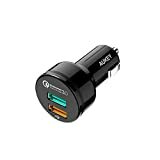 to a car’s audio system, providing that the car allows for auxiliary input—as most models do these days. 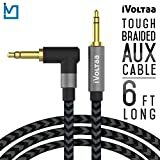 If you like listening to music while driving, an aux cable will allow you to plug into the speaker and listen to whatever music or podcasts you prefer. 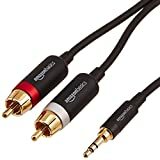 Here are a few things that you should look for when deciding which aux cable will best suit your needs. Coiled: Coiled cables are designed to remain coiled when not being actively extended (like older-model telephone cords). This makes it easier to keep them organized and out of the way when not in use. Uncoiled: Uncoiled cables can obviously be rolled up manually, but they are not as tangle-proof as coiled cables. 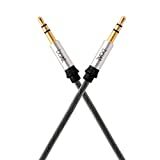 Connections: The most important factor for most reviewers is the connection quality that the cable has between the device and the speaker. The best brands make strong connections on both ends, allowing for clear audio quality. Durability: Nobody wants to have to replace a peripheral like this too soon. Great cords feature durable cables and connectors, which will last for years without needing to be replaced. 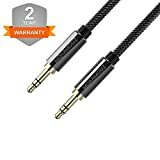 Cord convenience: One potential problem with aux cables is that they can get in the way, both when they’re plugged in and when they’re not in use. Better cables aren’t too long or too short (both of which can be a problem), don’t get tangled too easily, and are easy to roll up and store when not in use. 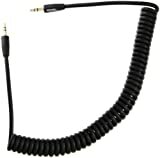 Cable length: Aux cables come in a variety of lengths. When choosing which cord is right for you, pick one that is long enough to reach where you normally keep your music player (whether it’s in a holder or just on the passenger seat of the car) without being so long as to get in the way. 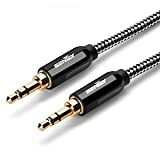 Device compatibility: Most aux cables are “universal” in that as long as the device has a port that will fit (usually a headphone port), it will work with the player. Still, some cables’ descriptions list specific devices that they are designed for, so you might want to take a moment and make sure your device is on the list. 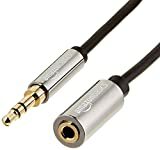 Fit with device: One of the ways in which an aux cable can work (or not work) with a device is the way in which it fits into the headphone jack—some devices have “recessed” jacks, while others don’t. 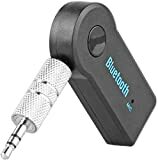 If you know what kind of specific jack your device has, be sure to look for a cable that will work with it, or the audio quality might suffer a bit. Belkin: Belkin is an American manufacturer of cables, cases, and other accessories for electronic devices. Founded in 1983, the company produces a wide range of products, which it sells globally. Cable Matters: Cable Matters is an American company that manufactures an array of cables, splitters, and other devices for computers, televisions, and audio devices. Chromo Inc.: Chromo Inc. is an American company that produces electronic devices and accessories. Their products include tablets, speakers, and a variety of aftermarket peripherals. StarTech: StarTech is an American company that produces and sells a variety of cables and other equipment for computers and other electronic devices.